My Oakland hills neighbors are a colorful bunch. One’s crafty, one’s flighty and one’s, quite frankly, a snake. Thank goodness I’ve my new fauna guide to keep track of them. 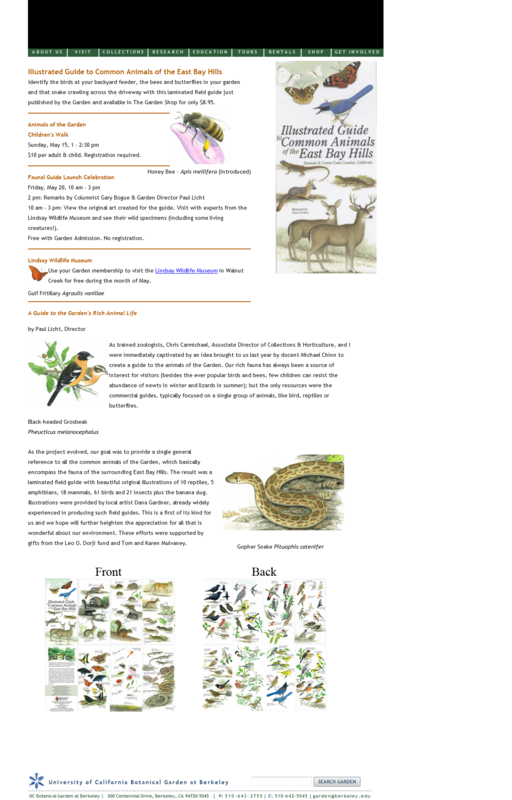 The UC Botanical Gardens at Berkeley is unveiling its new, laminated field guide today, with original illustrations of 10 reptiles, five amphibians, 18 mammals, 61 birds and 21 insects — all living in the East Bay hills. Oh, and I almost forgot the banana slug. It’s really in a class of its own, having been named a school mascot and all. The guide is the size of a map and unfolds for easy reference so you can take it on hikes or to your next garden party. In fact, it would make a great gift for anyone who appreciates the wonderful wildlife we have in our area. Check it out — just $8.95 in the Botanical Gardens garden shop. IN FLIGHT: A golden eagle has reportedly taken up residence in the canyon near Pinehaven Road and Thornhill Drive. One reader says he saw it glide 20 feet over his patio toward Temescal Creek and then disappear into the redwoods. The magnificent creature is impressive in flight, with a 6-foot wingspan, a huge hooked beak and wide tail. EMAIL BAG: Speaking of animals, someone is reportedly shooting feral cats with a pellet gun near Head Royce School. Reader Brian Petraska says there’ve been shots in the area and the ferals he’s been feeding (and had fixed) seem extremelyskittish now. To add to the concern, someone ripped down the fliers asking folks to be on the lookout for anyone abusing the animals. AROUND TOWN: Montclair Village had its first “Shop Local Extravaganza” last night, with discounts and music, free food and drink. If sales were up and it brought people to town, you can expect more of these extended-hour events in Montclair. Meanwhile, there are several new businesses in town including Subway, which is making its sandwiches where the old doughnut shop used to be (2087 Mountain Blvd. ); Hatch, selling eco-lifestyle products at 2054 Mountain; and McCaulou’s, which has expanded to include a shoe shop and David M. Brian-style home store. On the flip side, say goodbye to Magpie, the really cool shop for the under-30 crowd that did so much to make Montclair fun. Kevin Benafield did everything he could to make a go of it — even building a skateboard ramp for Montclair Park. SMALL STUFF: My column item on lucky pennies has spawned several responses from folks sharing copper coin stories. The best one comes from a reader who remembers the words that her mother used to tell her: “If you don’t honor the penny, you aren’t worthy of the dollar”.